Post by Nabaz Shexany Knn-Cinema. WI has hosted the Swimmable Water Weekend on Lake Dukan in Sulaimani Governorate of Kurdistan, Iraq in August of 2013, 2014 and September 2017. This marathon swim/paddle across the Lake starts near the town of Rania and heads southwards to the Dukan Dam. WI is seeking sponsors for a 2018 Swimmable Water Weekend and is looking to sign up new swimmers to join us in the campaign. Must be competent swimmers! What is the Swimmable Water Challenge? 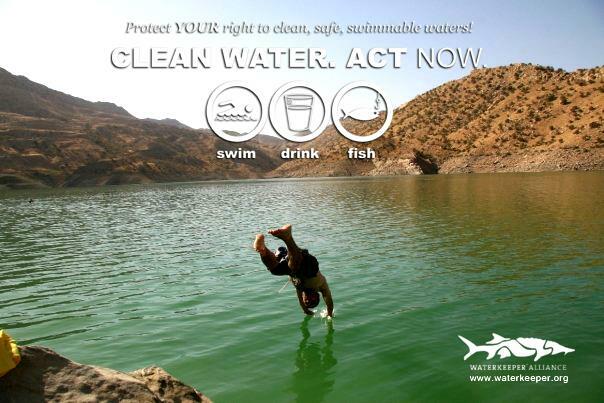 Our Goal is to highlight the importance of swimmable, drinkable and fishable waters throughout the communities of Kurdistan. As the RiverWatch Report Card shows, the rivers and waterways of Kurdistan are quickly deteriorating as rivers become choked by garbage, sewage and industrial toxins and diverted without thought to their natural function and services. The once clear flowing rivers and streams of our land are becoming muddied, polluted and dried. Nabil Musa, the Iraq Upper Tigris Waterkeeper, is a voice for our local rivers and river-dependent communities. He’s taken up the challenge with others to swim/paddle 40 kilometers from Rania to the Dukan Dam to raise attention and promote the cause of clean water and healthy rivers in Kurdistan.